Among the ruins of war, buildings that were only shells are being re-occupied.. Despite being part of Karabakh, there are almost no Karabakhis living here. The population is made up of immigrants from different regions of Armenia who speak different dialects. In some ways, Kashatagh is a “third” Armenia. It lacks the dramatic gap between social classes seen in Stepanakert or Yerevan. Nor is it infected with the corruption that influences life in so much of each republic. 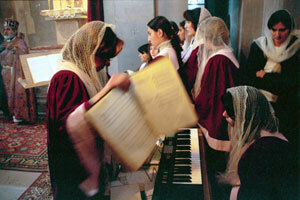 For many Armenians, Kashatagh is an escape. Here, they can move to a new region and start a new life where they become landowners instead of refugees. With the exception of officials, it is hard to find any who say they settled here for patriotic reasons. Together with his wife and two children Karo Meseljian moved from Yerevan to the provincial seat of Kashatagh, Berdzor (the city formerly known as Lachin) two years ago. He left his older son in Yerevan with his parents while he attends chess school there. In Yerevan, Karo had a small shop which was somewhat profitable. Now he rents out that shop and has started a business in Berdzor, bringing goods from Yerevan and selling them to local shops. Doctor Artsakh Buniatian “sacrificed my skills” to Kashatagh. Her daughter attends kindergarten and her son attends school. The family lives in a hostel, where about 200 families are waiting to get apartments that have been promised to those who come here to resettle. The government of Karabakh (with assistance from Armenia) spends about $600,000 a year building apartments for re-settlers. And for many, government subsidies make moving to Kashatagh an attractive alternative to life in most parts of Armenia. “We don’t accept everyone,” says head of Repopulation Department of Kashatagh Administration Robert Matevosian. “Sometimes we notice that people come here to get the non-recurrent financial assistance, and then leave. “We talk to migrants as long as it is necessary to find out whether they came here to stay permanently or not,” Matevosian says. Entering Kashatagh (Lachin), new red roofs are evidence of a region being regained. People move to Kashatagh for many reasons. 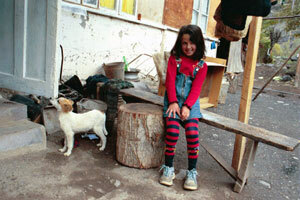 Some have sold their houses in Armenia to cover debts, and come here to start debt-free living. Some young couples want to start families separate from their parents. 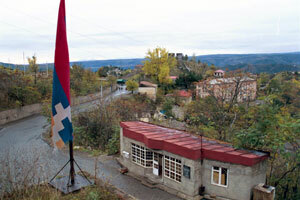 Most see the new region of Karabakh as offering opportunities they don’t see in their old homes. And one can meet various types of former officials in Kashatagh. In one village the director of the school is former head of the Education Department of Yerevan. In another village one of former president Levon Ter-Petrosian’s security service raises cattle. Former Minister of Defense of Karabakh Samvel Babayan’s assistant is head of the Social Department. There are two hospitals in the region, in Berdzor and in Kovsakan (formerly Zangilan), the second largest town, near the border of Iran. Each community has a nurse. At the Berdzor hospital, director Artsakh Buniatian insists on keeping his hospital a place where residents can receive free treatment. 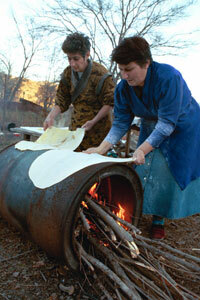 In their Kashatagh village Karine Ishkhanian and Svetlana Barseghian make lavash on an improvised oven. Eight doctors work in the Berdzor hospital. They earn 45,000 drams (about $80) a month. Buniatian says that it is almost impossible to find a doctor who will agree to work in the region. Nobody wants to come here and work only for salary, without taking money for services he says. Buniatian spent the war working in a field hospital in Karabakh. 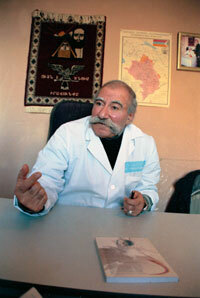 After the war he again returned to his former work, as a surgeon at a hospital in Abovian (just north of Yerevan). While he was trying to adapt he was invited to Berdzor hospital’s opening ceremony. The surgeon’s abilities are limited by a lack of facilities and about the most complicated case he can treat is appendicitis. While laying the foundation for a new society, culture has not been ignored in the resettling of Kashatagh. In 1996 a Museum of History was opened in Berdzor, which now holds some 300 exhibits, including bronze and stone items that date to the 4 th millennium B.C. Armenian household items from the 3 rd millennium B.C. to the 19 th century show the rich heritage of the region. Most items in the museum were collected by director Livera Hovhannisian, who before moving to Berdzor had worked for 18 years in the Yerevan Museum of History. Re-settler Karo Meseljian says: “Here, you feel like a human being.”. "During one month, I had traveled in 47 villages and collected all these exhibits to be in time for the museum's opening," she says. “Those days many villages hadn't been settled yet. Accompanied by two men I was going to every village by truck and we were searching and finding in every house things we had been looking for. In one village we were fired upon. Residents of that village hadn't seen other people for a long period of time and when they saw us they were very scared and thought we were Azeris." About 200 paintings are displayed in the gallery including works of Parajanov and Garzou. Some paintings were sent from the Ministry of Culture in Yerevan. As Armenian life in previously enemy territory is formed, one feature, the Church, lacks a significant presence in Kashatagh. In the entire province the only functioning church is Holy Ascension, built in Berdzor in 1997. In 2002, Diaspora benefactors restored a 4 th century church in the village of Tsitsernavank, however there are no clergy there. 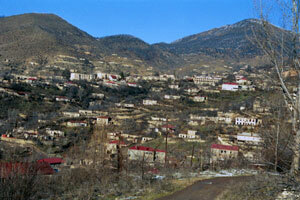 The highest settlement in Kashatagh is 1,700 meters above sea level; the lowest, 330. In the mountainous north, life is harsh and most villagers exist from raising cattle. To the south, however, farms prosper from generous growing seasons and fertile valleys of the Hakar River. Faith is on the rebound, too, though there is a lack of clergymen and churches. It was in such a valley that the first families resettled, mostly in Tsaghkaberd (formerly Gyuliberd) where 70 families now live. The Vardanian family, refugees from Kirovabad, were among the first. Three Vardanian children finished school here and one now studies at Stepanakert University. The family income is, literally, their “cash cow”. Each year the Vardanians sell a calf to cover essential expenses. Like their neighbors, the Vardanians harvest mulberry, fig, quince and pomegranate in addition to traditional crops. They make about 400 liters of mulberry vodka each year. Residents had hoped that by now there would be food processing plants in Kashatagh, but investments haven’t materialized. Slava Tokhunts is an exception. He moved to Kashatagh from the Goris region and brought a seeding machine with him. Every year he sows wheat on his 5.5 hectare property. “I don’t ask anything from anybody and I can also help those who are hungry,” he says. He makes cheese from milk of his six cows and then barters the cheese for various items such as sugar and clothes. Selling products out-right is difficult because trading involves going to one of the towns in Armenia, and most villagers can’t manage such trips. Over the past five years, the area of cultivated croplands has increased in Kashatagh from 5,000 hectares to 12,000 hectares. The number of livestock has increased to about 26,000 head (cattle, goats, sheep). At the same time, the stream of migrants has tapered. Between 1997-98, nearly 800 families moved to the province. Last year, 80 new families settled there and about the same amount left.